Communication is the key to success on any worksite; but, staying connected is difficult when you’re working in a remote location. Perhaps you’re building a resort on an island where there’s limited cellular service or maybe you’re doing an archeological dig in the mountains. Whatever the case may be, a business two-way radio is an absolutely must. Why? – Because it keeps you in touch with your team, improving efficiency and safety. To learn more about each option and determine which one will best suit your needs, read through the following reviews. When you’re ready to make a purchase, click on the yellow links to find the best prices currently available on Amazon. 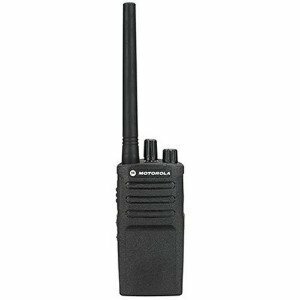 First up on our list of the best business two-way radio is the Motorola Business CLS110 5-Mile 1-Channel UHF Two-Way Radio. 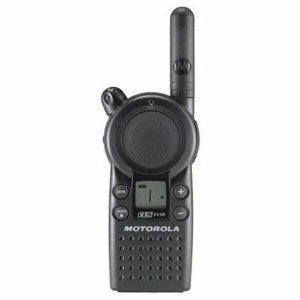 Motorola is one of the best names in the communication technology industry and offers a variety of high-quality products, including handheld ham radios, hunting two-way radios, marine VHF radios, and so much more. This walkie talkie operates on 56 business-exclusive frequencies; plus, it offers 121 privacy codes, so you’ll have plenty of combinations to choose from for greater security. The rechargeable lithium ion battery offers up to 18 hours of power when it’s fully charged; when it’s time to power it back up, just pop the battery onto the charger. You can also power it with a AAA batter for backup power when you can’t get to a power outlet. This device can transmit and receive signals approximately 200,000 square feet away, or as many as 15 floors in a multi-floor structure, so you’ll have plenty of range to stay connected with your crew. It also has a keypad lock, which safeguards you from accidental changes in the settings. It’s compact and lightweight, so it won’ weigh you down. Lastly, you can choose from one of the three different call tones for incoming transmissions. Based on the reviews that we read, most of the customers who have used this device said that they were very pleased with it. They said that it’s durable, lightweight, and reliable. Final Verdict: The Motorola Business CLS1110 5-Mile 1-Channel UHF Two-Way Radio is a durable, easy to use two-way radio that offers safe and convenient communication in all types of industries and settings. Next up is another Motorola two-way radio. The fact that we’re featuring two Motorola devices on our list is a true testament to how reliable and well-built this manufacturer’s products are. If you work in an industry where staying up-to-date weather forecasts is important, then RMV2080 On-Site 8 Channel VHF Rugged Two-Way Business Radio with NOAA is a great choice. Channel 8 on this device is set to receive official notifications from the National Weather Service 24 hours a day, 7 days a week, making it a reliable weather radio. Weather updates aren’t all that this device has to offer; it’s packed with features that make communicating on the jobsite faster, easier, and more reliable. It operates on 27 VHF business exclusive frequencies; plus, its FCC narrowband ready. It also offers incredible audio quality so you can hear in all types of conditions; whether there’s drilling, jack hammering, bulldozing, or any other type of loud noise in the background, you’ll be able to hear your transmissions with no problem on this device. The customized channel announcement feature allows you to keep your hands free, which means that you can keep your hands where they need to be. This two-way radio is built of highly durable; in fact, it has gone through rigid Accelerated Life Testing, Motorola’s exclusive testing that simulates up to five years of field use to ensure that the durability of the device. With such incredible durability, you’ll have confidence knowing that it can handle bumps, bangs, and drops with no problem. Customers who have used this business walkie talkie are very happy with it. They say that it’s extremely reliable, very easy to use, and that it is built to last. Final Verdict: The Motorola RMV2080 On-Site 8 Channel VHF Rugged Two-Way Business Radio with NOAA is one of the best business two-way radios on the market. It’s exceptionally rugged, transmits round-the-clock weather updates, and offers clear reception and reliable transmission. 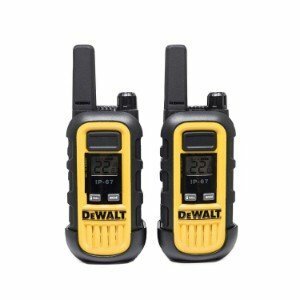 If you’re on the market for a long-range two-way radio, the DeWALT DXFRS300 Heavy Duty Business Walkie Talkie is definitely an option worth considering. It can transmit up to 250,000 square feet, or through 20 floors in multi-level structures and offers extended signal range, making it a long-range walkie talkie that offers reliable communication across large spaces. This walkie talkie boasts a total of 22 preset channels, and they’re all preset with privacy codes, which helps to reduce the amount of interference you receive from other two-way radio users and improves your privacy; in fact, in total, there are 2,662 channel combinations to choose from. The device is also exceptionally durable; it’s shock resistant and can handle up to two meter falls, and it can be immersed in one meter of water for up to 30 minutes; and, it’s dustproof. The 360 degree swivel holster, which comes with the device, allows you to attach the walkie talkie to your belt and hold it in the most comfortable position for your needs. It also boasts voice activated transmission (VOX), which keeps your hands free so you can focus on your work. A power save mode automatically turns the device to battery save mode if it hasn’t received a transmission for 10 seconds, which conserves power. Other notable features include a clear LCD display, audio squelch, and roger beep tone to let you know when the transmission is complete. The device is also lifetime warranty, you’ll have peace of mind knowing that if anything happens to the device, DeWALT has you covered. Final Verdict: With the DeWALT DXFRS300 Heavy Duty Business Walkie Talkies, you’ll have durable, reliable, long-range communication on the worksite. Shockproof, waterproof, dustproof, and offering a wide range of channel options for privacy, this business two-way radio is ideal for all types of environments. Plus, it’s easy to use and very affordably priced. The BTECH MURS-V1 MURS Two-Way Radio is another outstanding business two-way radio that offers reliable transmission on remote locations and job sites of all types. It’s easy to use, lightweight, and durably built; and, it’s very affordably priced. This walkie talkie features channel skip, which means that you can easily add or remove a channel from the scanning list; if you’ve ever had to deal with nuisance channels, you know what a handy feature this can be. It also boasts a built-in receiver and at the same time, it can monitor two channels; in other words, it can watch two frequencies and connects you to the first station that receives an incoming call. The large tri-color LCD screen is easy to read in any type of lighting. A built-in LED flashlight keeps you safe when the sun goes down or in dark settings. Other key features include VO, so you can stay hands-free, programmable alpha numeric channel storage, transmission timeout, and busy channel lockout. Powered by a 1800mAh battery, and it comes complete with a two-way radio headset and earpiece for total convenience. As per the reviews that we read, the users who have purchased this device are very happy with it. Most customers are very pleased with the durability, ease of use, and clear reception that this device offers. Monitors two frequencies and gives preference to the first station that receives an incoming call. Final Verdict: With the BTECH MURS-V1 MURS Two-Way Radio, you and your crew will be able to stay connected on the job site, and you’ll be able to do so with ease. This device is loaded with features, offers clear transmission, and is very easy to use. If you have a large crew that you need to keep connected, the Retevis H-777 Two Way Radios UHF Radio 2 Way Radios is an excellent option. This set comes with a total of 10 business two-way radios, so you’ll have a device for every member of your work team. Each of the devices that come with this package has been preset to the same frequency, as well as the same channel, which means that you and your crew will be able to have instant communication right out of the box. Each walkie talkie also boasts a handy voice prompt function, which allows every user to locate the channel that the entire group is on and adjust the channel settings while keeping their hands on whatever they may be working on. All devices are outfitted with a built-in flashlight, so all operators will be able to see in dark conditions. Each unit offers 16 channels and 50 privacy settings, so you and your team will be able to keep your connection secure. Based on the reviews that we read, it seems like most of the people who have used this set of walkie talkies are pleased with them. Users say that they offer reasonably clear transmission, that their easy to use, and that they like the hands-free capability. Final Verdict: For large crews, the Retevis H-77 Two Way Radios UHF Radio 2 Way Radio is a great option. 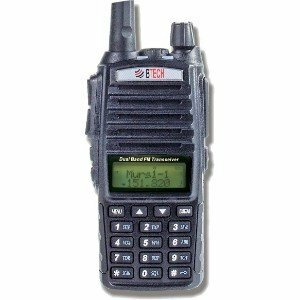 It comes with 10 business two-way radios that are set to the same frequency and they all offer the necessary functions for easy communication. The Federal Communications Commission (the FCC) offers several frequencies that can be used for communication purposes. Specific frequencies have been designated for business use only, which means that they cannot be used by the general public. Business two-way radios connect to these frequencies, and they serve as a reliable and clear form of communication for professionals. 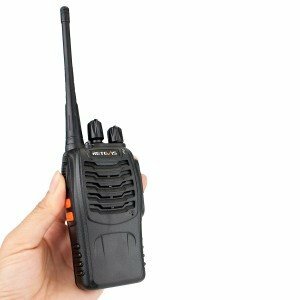 Why should you invest in a business walkie talkie? Because, as mentioned, they serve as a reliable form of communication. Since they operate on radio frequencies, they work in remote locations and areas that don’t have stable access to other types of connectivity, such as cellular reception. That means that if you are working on a jobsite in the woods, on a beach, or even within a steel structure, you’ll have a way to stay connected with your crew. These devices ensure that everyone on your staff is aware of work conditions and stays on tasks. They also improve safety, many two-way radios for business receive weather alerts and have built-in flashlights, for example; not to mention the fact that they can be used for emergency alerts. If someone becomes injured, for instance, the user can call for help on a two-way business radio. Additional features; some devices offer built-in flashlights, keypad lights, headsets, voice control, emergency weather alerts, and more! By taking these factors into consideration, you will be able to select the best business two-way radio for your specific needs and increase the productivity and safety of your team. A business two-way radio is a fantastic way to stay connected on the job. Each of the units featured in our review are high quality, durable, and offer great transmission and range. No matter what your needs may be, you can be sure that you’ll find a two-way radio for business in this review that will work for you and your crew.